You are here: Home / Safety Savvy / Window Safety: Don’t Get Blindsided! It’s National Window Safety Week. Nonetheless, you have a window of opportunity every day to help keep your little munchkin safe. Over 20 children a year in U.S. on average are strangled by a window covering cord. So…be on the lookout for window blinds with cords in your house and Grandma’s and get rid of them. Yes—replace them all with cordless window shades, blinds and drapes. Whatev. Just be sure they’re cordless window treatments. Going cordless is the only way to be 100 percent kid safe. Linsey Knerl, a mom of five from Tekamah, Nebraska, knows firsthand how dangerous window blinds with cords can be. One day, while watching TV with her three of her young boys, she decided to head to the kitchen to look up a recipe for dinner. She had just flipped open a cookbook when her oldest son, Micah, who was 4 at the time, came up beside her and said, “Mom, Baby Moses needs help.” Guessing that her 11-month-old had pushed his sippy cup under the living room couch, Knerl didn’t think much of it. After all, she could hear that Moses wasn’t crying. Knerl quickly untangled Moses from the cord and he started to cry. Then she called her pediatrician, who told her that despite the ligature marks on Moses’ neck, he was fine because he was crying and drinking from his sippy cup—both healthy signs. “While standing up against the back of the sofa, Moses must have reached behind to play with the window blind cords and then rolled sideways standing up, which tightened the cord, practically lifting him off the couch,” Knerl says. This frightening experience, which I reported on for Parents, could have easily ended in tragedy. The close call prompted Linsey’s husband to remove all 25 window blinds from their rural home, which had been installed years ago by Linsey’s parents, who owned the house originally. “On our farm, we have a whole different set of rules when it comes to safety. We had a wood-burning stove in the basement for a while. We have animals and electric fence. The window blinds just weren’t on my radar, but this experience taught me a lot,” she says. Just one example of a corded window blind. Yikes! Reports like these are why SelectBlinds, a leading online retailer of custom window coverings, is now only selling cordless window blinds and they’re encouraging the industry to do the same. Window Covering Safety Council (WCSC) and the U.S. Consumer Product Safety Commission (CPSC) urge caregivers and parents like you to replace window coverings with exposed or dangling cords, with cordless window coverings, which have cords that are inaccessible. The CPSC says everyone with young children in the home (that includes grandparents) should buy cordless products, or window coverings with inaccessible cords, which can be found in stores nationwide. Consider it part of your baby-proofing plan, which I cover here. There are so many cordless products available in different styles and colors, such as cordless drapes, sheers, light-filtering cordless shades, cordless blackout shades, cordless roman shades, cordless mini-blinds, faux wood blinds, shutters, cordless pleated shades, and cordless motorized shades to name a few. All of these come in a variety of sizes, patterns, and fabrics from which to choose. 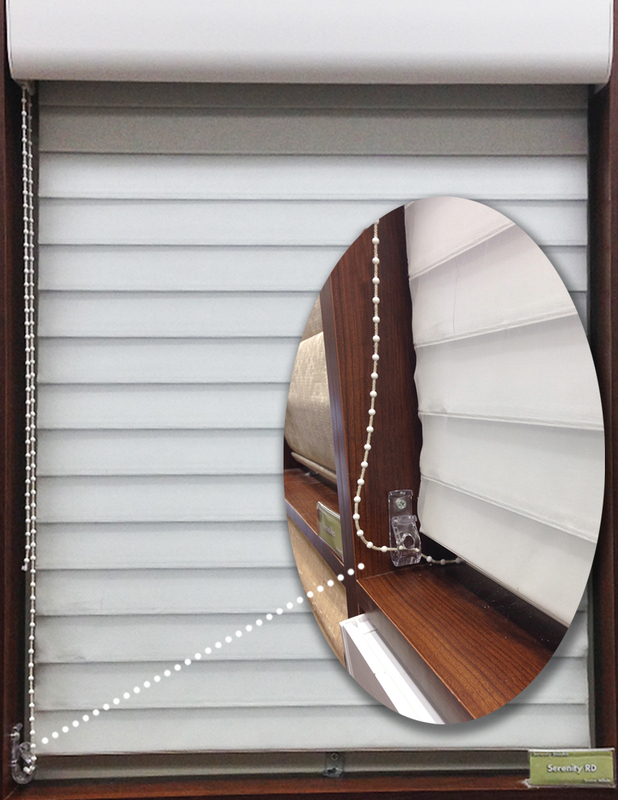 So you can tell which window blinds are safe for kids, you can shop at a 100% cordless retailers such as Selectblinds. Or, look for the Best for Kids certification seal when shopping for window coverings in general. The Window Covering Manufacturers Association launched the “Best for Kids” certification program to help consumers and retailers easily identify window covering products that are suitable for use in homes with infants and young children. Only manufacturers of window blinds that pass third-party testing are allowed to label their product with the “Best for Kids” certification seal. Install only cordless window coverings, or window coverings with inaccessible cords, including cordless drapes, in homes with young children. Think beyond the baby’s room. What about your living room, dining room, kitchen, family room, play room and den? Move all furniture, cribs, beds and climbable surfaces away from windows. Besides the threat of strangulation, windows are a major fall hazard. Mount window guards or window stops to prevent children from potentially falling from from a window. Window stops ensure that windows can’t open more than 4 inches if young children are in the home. In honor of National Window Safety Week, SelectBlinds is kicking off a Go Cordless campaign to educate and empower consumers and the window covering industry about the risks of window cord strangulation. The leading online retailer of custom window coverings is partnering with Parents for Window Blind Safety. Each month, SelectBlinds.com will upgrade an entire home, apartment, military housing unit or daycare facility with custom cordless window coverings at no charge. To enter, go to www.selectblinds.com/gocordless.html#ProjectCordless to submit a 30-second video to nominate your friend, colleague or family member for Project Cordless. What should you say in your nomination video? Share your inspiring story of how your nomineee has shown strength in ways you never thought possible. Or, have someone nominate you! Nominations will be accepted now through 12 AM on January 1, 2017. Have you tossed out your corded window coverings lately? Lemme know. Leave a comment on Facebook. Copyright Sandra Gordon Baby Products Mom 2016. Thank you for the valuable information you have shared and also for the guidelines it is helpful and must be the good tips for every mother for the safety of their children. Thanks for your comments Jenni! Blinds are adjustable and hence they are preferred to make it more comfortable for living by adjusting the light and warmth accordingly to the seasons. There are many types of window blinds available in market in today’s date and many companies floating here and there which sell window blinds. But you need to choose only Duette company, if you want to buy a window blind of standard quality. Thanks for your comments, Discover! Wow, that’s a frightening story. Good information.